Biswa's Blog: Election Time - Vote on 21 st February! Election Time - Vote on 21 st February! It all started with a pledge taken to vote. In an innovative move taken by The State Election Commission, Maharashtra, voters in Maharashtra were asked to take action this year by pledging their votes by giving a missed call on 9029-901- 901. Voters could also then get access to the Mahavoter chatbot and have a lot of their queries tackled via this unique chatbot on Facebook messenger. Under the helm of the current State Election Commissioner Shri. J.S.Saharia, the MSEC has done a lot this year to make sure that voters get more involved as well as get more inspired to get out and cast their votes. And we voters are now running out of excuses! Firstly, the power of social media has been harnessed to help bring out change in the electoral and voting process. 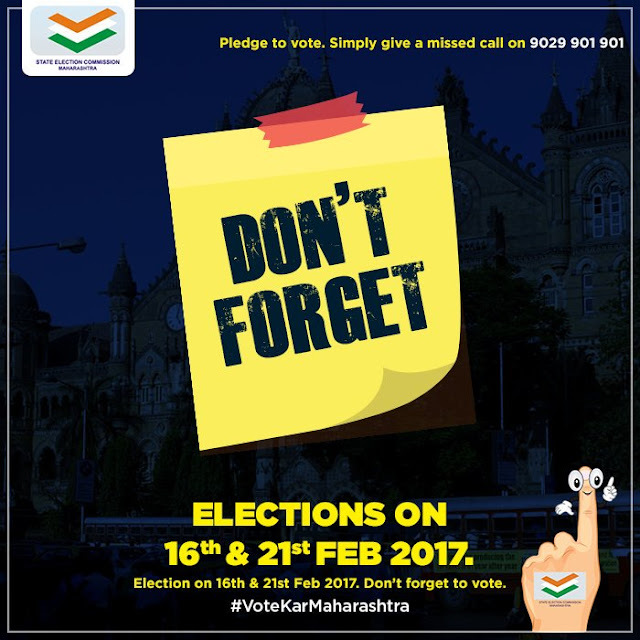 The State Election Commission, Maharashtra has also been actively campaigning for fair and ethical elections, as well as providing information via their social media platforms. The election process also underwent a transformation by the addition of varied processes like online nomination process, decentralization of powers for efficient and effective decision making, use of software for bifurcation of the voter list etc. as well as the launching of multiple apps for users for guidance by the MSEC. The desire to vote is definitely further supplemented by an Election Commission that not only aims to take action, but also delivers the necessary steps in order to make it better for voters overall. I look forward to casting my ballot tomorrow, with all the information I need at hand. What do you think helps you in being a proactive voter and citizen?